Potatoes can be attacked from the time seed pieces go into the ground until they are harvested. Insects can feed on tubers, seed pieces, leaves, and stems from planting to harvest. 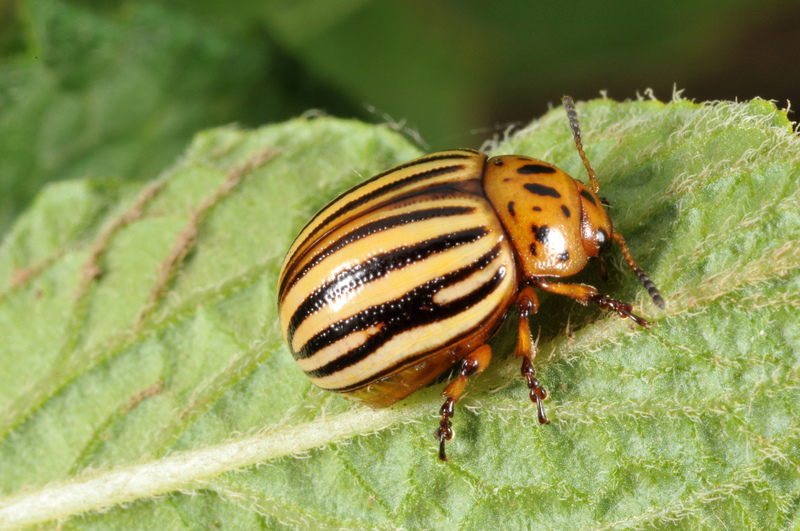 The most devastating pest of potato in Indiana is the Colorado potato beetle (CPB). The adult is a yellow, ovalshaped beetle about 1/4 to 1/3 inch long with 10 black stripes on its wing covers. Larvae are bright pink to red with black heads, and older larvae have two rows of black dots on the sides of their bodies. The adult overwinters about 6-10 inches below the soil surface, usually outside the field where it fed as a larva. CPB move to fence rows, waterways, etc. at field edges to burrow into the soil and overwinter. In early spring, when soils are warm enough to plant potatoes, CPB emerge and begin searching for a suitable host plant. When they find one, they immediately begin to feed. 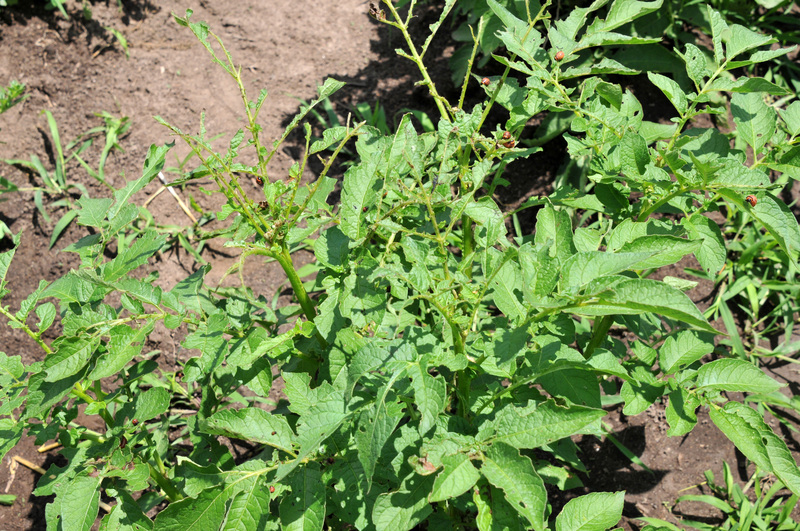 CPB will feed on any plant in the potato family, such as tomato, potato, pepper, eggplant, tobacco, and weeds, such as buffalo bur and nightshade, but they prefer potato. CPB adults mate, and each female beetle lays groups of 10-20 eggs (a total of several hundred), usually on the underside of lower leaves. Eggs hatch in 4-10 days, depending on temperature, and larvae begin to feed on tender young foliage immediately. First and second instars do not consume much leaf tissue because of their size. Third and fourth instars cause the majority of defoliation and tend to feed on older leaf tissue. Larvae have a habit of feeding on leaves in the top portion of the plant. After 2-3 weeks of feeding, larvae drop from the plant, burrow into the soil, and pupate. Adults then emerge from the soil 2-3 weeks later. These adults will also feed, mate, and lay eggs. In late summer, the second generation larvae drop, burrow into the soil and pupate. These adults will emerge, feed for a few days, and then burrow into the soil for the winter. 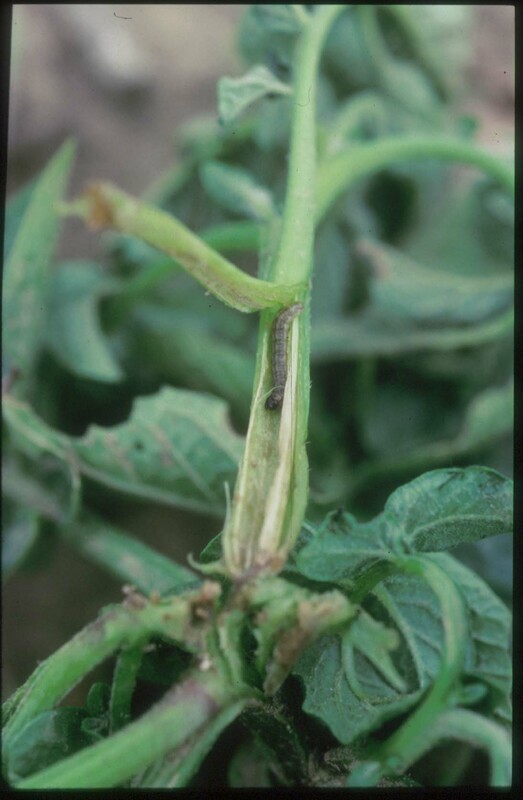 Although both adults and larvae feed on the leaves of potato and related plants (tomato, eggplant), the most damage is caused by the third and fourth instar larvae. These larvae are large (1/2 inch) and can defoliate a plant within 1-2 days. Potatoes can be defoliated by as much as 30% before flowering or during tuber fill and yields are unaffected. However, when potatoes are flowering, they cannot tolerate more than 6-8% defoliation. One of the major concerns for growers in Indiana is the problem of CPB resistance to insecticides. CPB develop resistance when they are exposed to the same insecticide or class of insecticides year after year. Thus, relying solely on frequent applications of chemical insecticides is not a good economic or long-term strategy for CPB control. One very effective way to reduce CPB populations is to rotate out of potato to a nonhost crop (e.g., corn, soybean, alfalfa, sorghum). When CPB emerge in the spring in a field that has been planted with a nonhost crop, they are forced to walk or fly to find another potato field. If the field in rotation is located at least 1/2 mile away from any other potato field, only a few beetles will reach the new fields. This method works for two reasons. First, although not all adults emerge at the same time, by the time third instars appear in the field, almost all adults have emerged. Second, potatoes can withstand some defoliation at this time, making it possible to wait until all adults are present. However, the field should be sprayed before too many third or any fourth instars are present. Another consideration is that keeping the number of insecticide applications to a minimum will delay CPB resistance. For second generation CPB, no sprays should be applied until eggs begin to hatch, because insecticides do not affect CPB eggs. However, it is possible to control most of the second generation with one or two well timed applications. The potato leafhopper is usually present each year, but it is only an occasional problem. The adult is about 1/8 inch long and yellow-green. Adults are blown to Indiana from southern U.S. regions in the summer. For this reason, they are rarely a problem in the early part of the season, but can be a problem by mid- to late May. Once in the crop, reproduction is continuous, with three to four generations a season. Nymphs are basically smaller versions of the adult but are unable to fly. 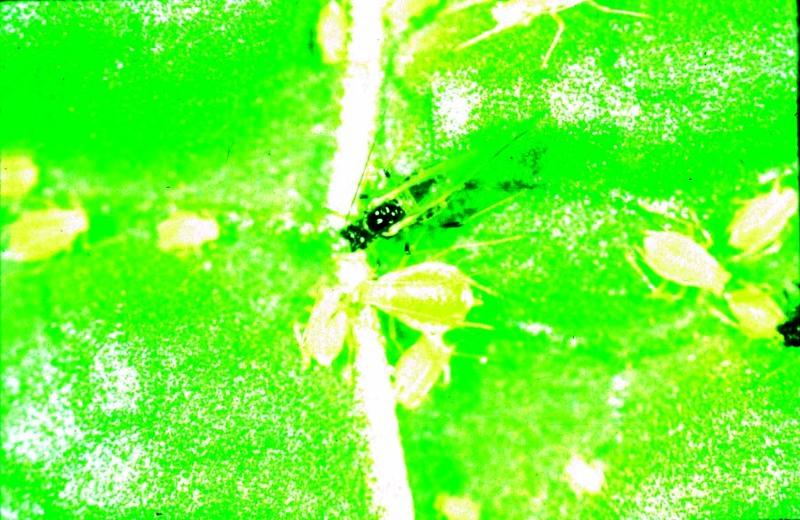 Potato leafhoppers feed by sucking juices from the potato plant. The first signs of leafhopper feeding are a subtle paling of veins and a curling of leaflets. 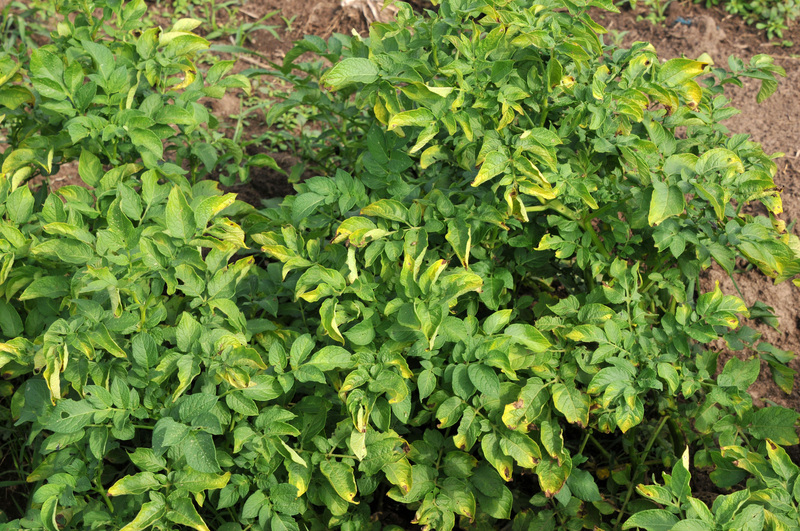 Continued feeding causes a characteristic triangular yellowing or browning of the leaf tip known as “hopperburn,” in which potato foliage becomes curled and yellow. Injured plants usually are stunted, and yields are reduced. Leafhoppers cause the greatest amount of damage as tubers are filling. Potato leafhoppers, while difficult to see, are easily controlled with insecticides. However, growers should not wait until the symptoms of leafhopper damage (i.e., hopperburn) appear in the field, because yield has already been reduced by this time. Growers should treat when they find one or more nymphs per 10 leaves. Fields should be watched closely beginning in mid- to late May for the appearance of leafhoppers. 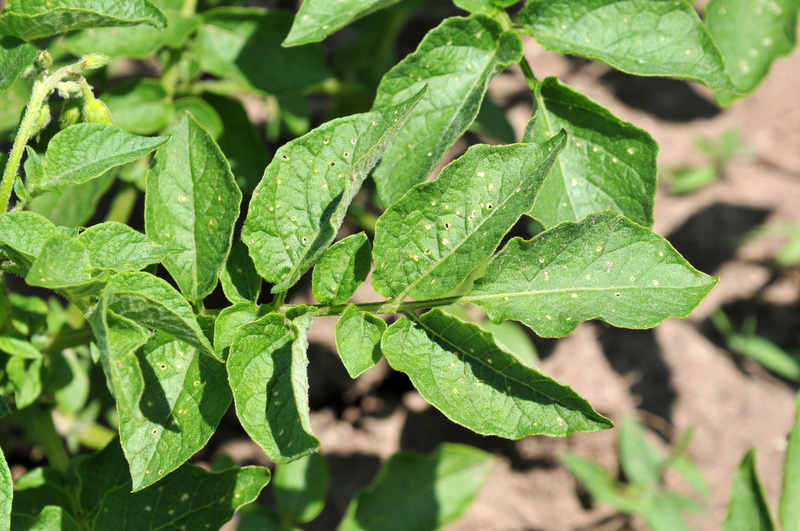 Aphids, or “plant lice,” are a pest of many crops, including potato. These small (1/20 - 1/10 inch long), greenish- to blackish-colored, soft-bodied insects usually are found on the underside of leaves. Immatures look like adults, except smaller. Adult winged aphids first move into potato fields between mid- to late April in southern Indiana and early to mid-May in northern Indiana. These aphids will “test” each plant they land on until they find an acceptable plant to feed upon. Aphids then will move to the underside of a leaf, lose their wings, and begin to feed by sucking juices out of the plant. The sucking of plant juices can lead to wilting and loss of yield. 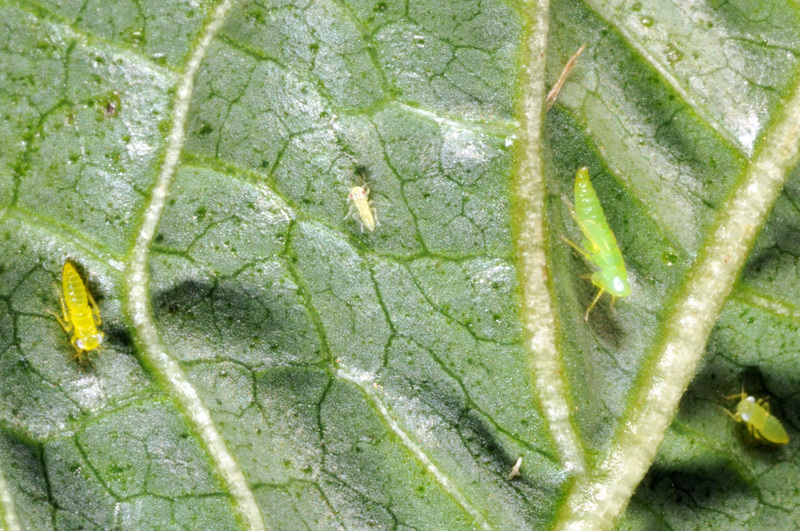 Large populations of aphids can cause the upper leaves of plants to develop light green spots, usually followed by curling of the leaf margins. As with leafhoppers and “hopperburn,” once these symptoms of aphid damage appear, tuber yields are already greatly reduced. This reduction in yield can be as great as 64%. Virus problems in potato in Indiana are usually not a problem. There are many natural enemies of aphids, such as lady beetles (adult and larvae), lacewing larvae, syrphid larvae, and parasitic wasps. These predators can be very effective in reducing and controlling aphid populations. These predators, however, are very sensitive to insecticides. 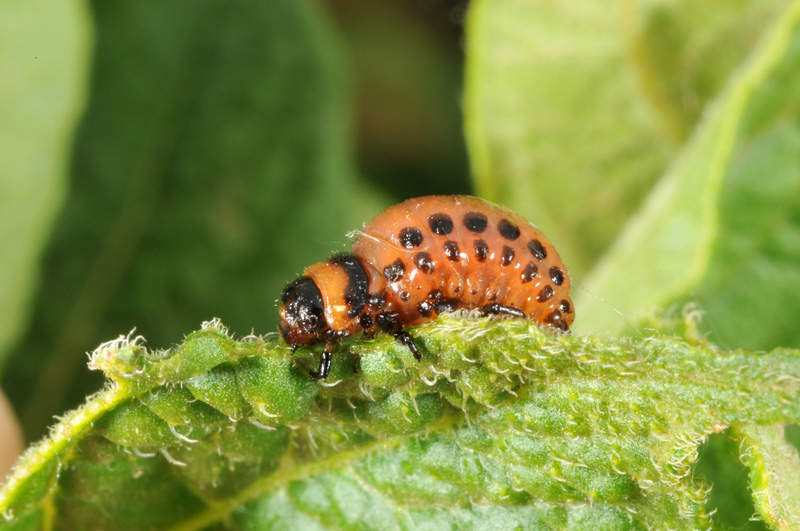 Therefore, growers should try to keep their insecticide applications to a minimum when controlling other primary pests such as Colorado potato beetle. (See Colorado potato beetle section.) Several insecticides can be used to control aphids when populations reach an average of two aphids per leaf. Flea beetles are small (1/25 - 1/16 inch long), usually dark colored (black with no stripes, black with two yellow bands on wing covers, or metallic) chewing insects. They have enlarged hind legs and when disturbed, jump in long, rapid “flea-like” leaps (hence their name). Adult flea beetles overwinter in or near fields under plant debris. They become active in early spring, feed on weed seedlings, and disperse readily when temperatures reach 68°F. 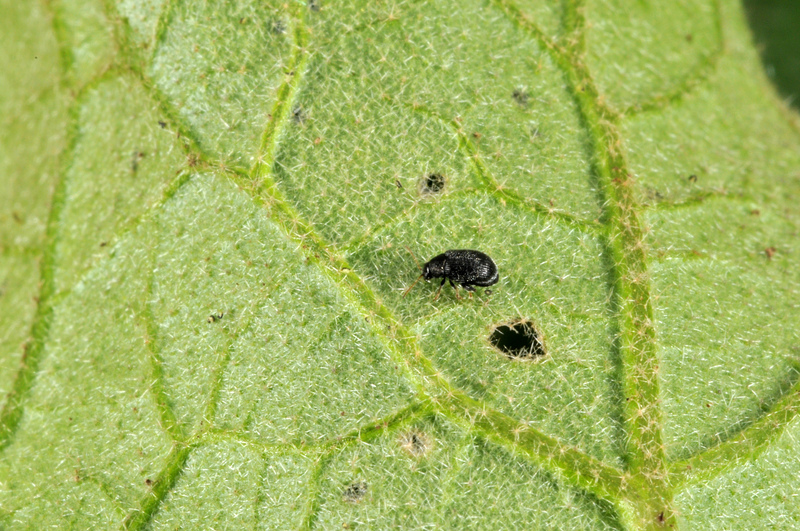 Adult beetles chew small holes in the potato leaves, which creates a shot-hole appearance. Unless beetle populations are very high (2 beetles/sweep with net), damage usually is not economic. If enough defoliation does occur, however, there are numerous insecticides available that will control the population. Most insecticides applied to control CPB or potato leafhopper will also control flea beetles. Wireworms are slender, hard-bodied, wire-like larvae of the click beetle. They are yellow-brown and range from 3/4 - 1 1/2 inches long. They can remain in the larval stage for 3-7 years, depending upon species. The larvae will feed on and in seed pieces soon after planting. They usually are only a problem if the field was in sod, was fallow the year before, or if there was a wireworm problem in the field in the past. One way to test for wireworms is by placing four or five baits in the field 3-4 weeks prior to planting. Baits can be a handful of untreated wheat, corn, potato or flour buried 6-8 inches deep in the soil and marked with a flag. In 10 days, the baits can be dug up and searched for wireworm. More than one wireworm per bait station will result in economic damage, and treatment will be necessary. 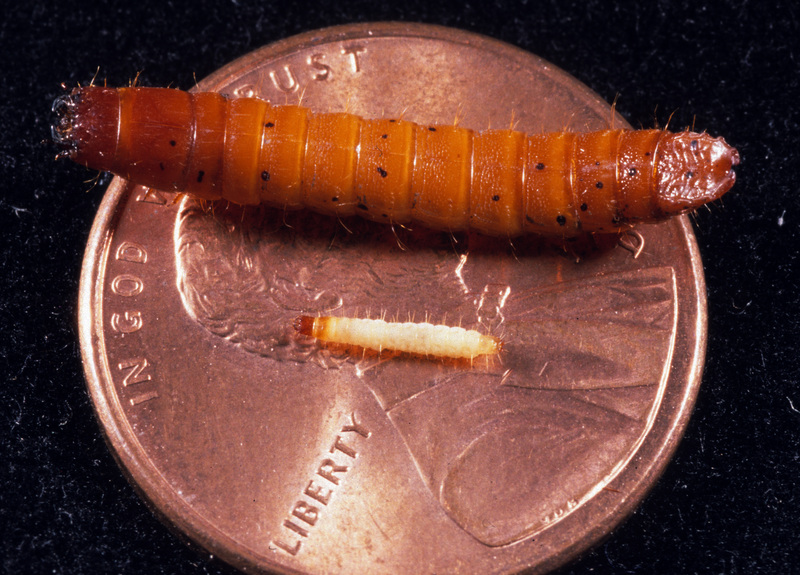 European corn borers are rarely pests of potatoes in Indiana. They overwinter as larvae and pupate in spring. Moths emerge in mid- to late May, then lay eggs in late May to early June. The adult female moth is 3/4 inch long and yellowishbrown. 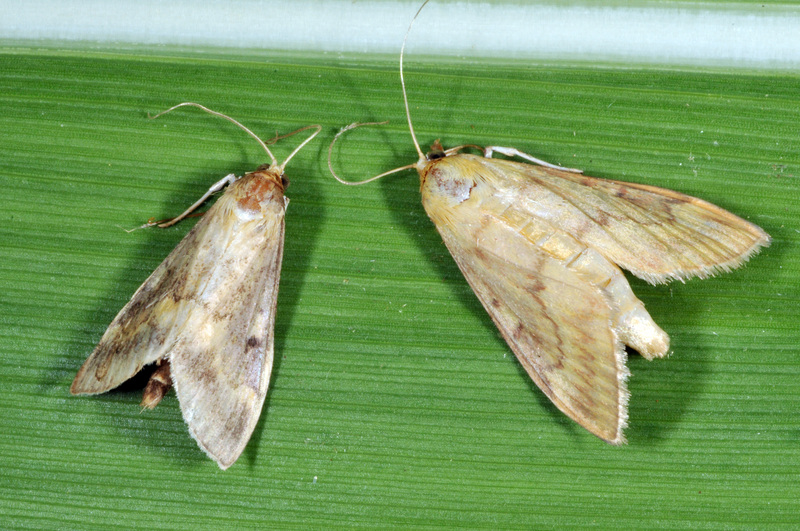 While they prefer corn, they will lay eggs into the leaf axil of potato if the moth population is large. 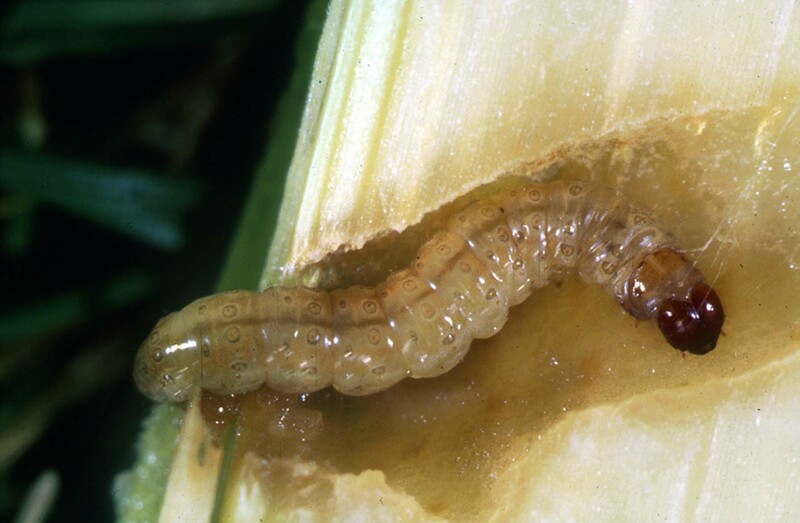 Larvae that emerge from eggs feed on the inside of the stem for approximately 2-3 weeks. They then pupate inside the plant and emerge as moths 1-2 weeks later (mid- to late July). Larvae bore into the stem soon after hatching and are not controllable once inside the plant. 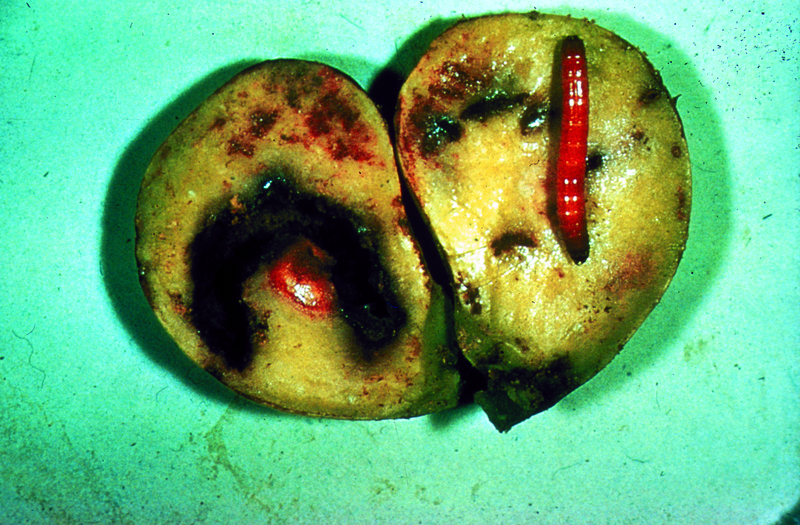 Growers, therefore, have only a short time period to control this pest. Once inside the stem, the larvae plug their entrance hole with frass and begin to tunnel. Often, infested plants will have dead stems. If the base of the stem is inspected, the frass covered entrance hole of the ECB can usually be found. Fortunately, this pest is usually not severe enough in Indiana to warrant control measures.